she has a great sense of direction, which I do not, and so may not need it. 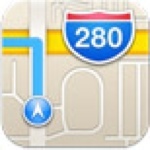 Turn by turn directions will, it has subsequently announced (quietly, in small print on the Apple website) be available to iphone4S and the new iPad (iPad3) only. Meaning if your device hasn't got the A5 chip you'll need to upgrade to enjoy these features, although I wouldn't upgrade yet, wait for the next iPhone. Cant wait to see the new technology. Google maps on my Android has sent me in the wrong direction on several occasions. When I eventually get the next iphone it will be nice to see a nice change.